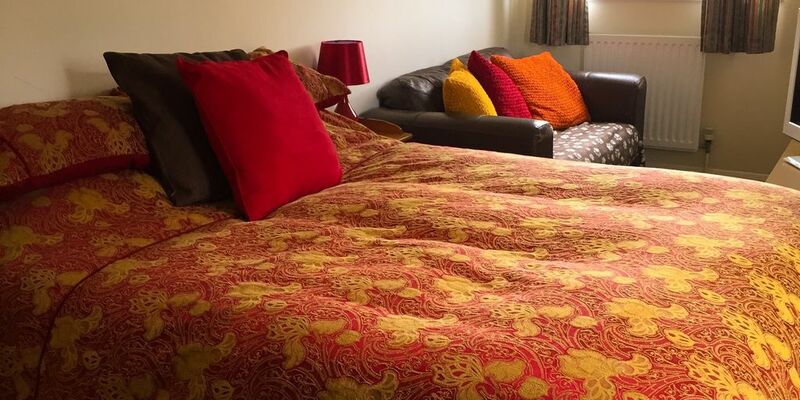 You will have one large bed/sitting room with a double bed and 2 seater sofa and a second bedroom with a permanent single bed and another fold out single bed available if needed. Private kitchen with self catering facilities - cooker, microwave, kettle, toaster and all necessary equipment. Bathroom with an over-bath shower. It's not a fancy, five star palace, but it is clean, equipped and private. We, as hosts, do whatever we can to make our guests' stay comfortable. We're close to the beautiful Rutland Water. You'd need a car as the public transport isn't great in our village. The area is very popular for cyclists and hikers, plus there's always lots going on, especially through the summer months, at Rutland Water. All year round the area is popular and the scenery and nature is fantastic. The West Wing itself is fully self contained, it's located on the first floor and has a private entrance. We have tried to equip it so guests have what they need, but we'll learn what's missing by guests telling us! Please let us know ahead of your visit if you need anything from us to help make your stay comfortable. We've got a big driveway so plenty of off road parking. We have a huge garage with plenty of secure storage space for guests who bring bikes or sports equipment etc. Village location, we have one shop/post office, one fish and chip shop, one pub which does very nice food. It's a fairly quiet location, closest shops are in the town, about a 10 minute drive, and things are generally not open late. Transport needed. We're 3 miles from the A1 and 4 miles in the other direction from Oakham. There is a train station at Oakham where you can get a train to Peterborough, Stamford, Leicester and more but you'd need to drive to Oakham to get the train. The lovely Rutland Water is less than 10 minutes away, we are closest to the Whitwell entrance and the Sykes Lane main visitor centre. Rutland Water is not just a reservoir, it is a popular cycling and hiking location, with numerous watersports and outdoor activities, even a beach area! Great for a family day out. Well behaved dogs welcome (maximum 2 or 1 large). We have two dogs but can keep them away from guests and guests' dogs if necessary - we do have an Alpha Female. Some of the West Wing needs a facelift but it's clean and comfortable. It fits 2 or 3 people easily, 4 at a squeeze! If there's four of you, we will need to use the fold out bed, it's quite comfortable but better for a smaller adult or a child. Children are welcome but we are not equipped for very young children, we don't have a cot, stairgates or a highchair. If you can bring your own then you are more than welcome to bring your tiny people with you! We also run cooking tuition from the West Wing (not while we've got guests in of course!). The tuition focuses on simple, home cooking, adapted to suit specific or limited dietary needs, ie allergies, veganism etc. If you are interested in this, please let us know. We're Julie and Gerry, a couple who have recently bought our lovely home in the countryside, in the heart of the smallest county in England. We live here in the main house, with our two beloved dogs Izzy and Maggie. We love exploring our new area and hope our visitors will do too. Outside of our local area, we love travelling and Thailand is our favourite place. We moved to Rutland to get away from the busy town we previously lived in. We wanted a quieter pace of life and fell in love with our house when we saw it. It's not fancy, it's just an old council house, that's been converted and extended to provide us with a great living accommodation, lots of room for us and our ladies and countless walkies nearby! We bought this house not just because of the house, but the location. For us, it's perfect. Very clean, tidy, well appointed & comfortable and in a good location for touring the area. Thank you for your review Syd. It was a pleasure hosting you and your family, although we didn't see you very much! I'm glad you enjoyed your stay and we look forward to seeing you again.